I have been using Dove products for decades. I think Dove was the reason why I switched to body washes most of the time when I shower. 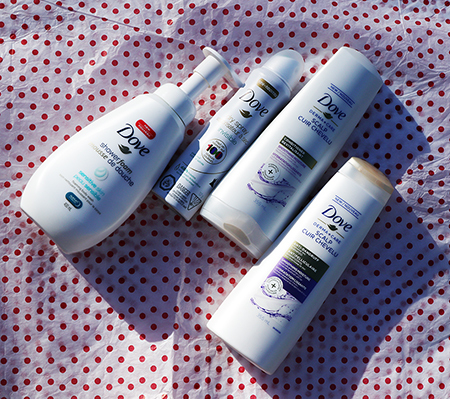 Dove has some great items that you have to try for this Spring. Just to let you know, I have crazy long course Asian hair and I can be a bit obsessed with hair products so I can keep them silky smooth. Dove hair care has never disappointed me so I wouldn't be surprised how my hair feels when I use the Dove Derma + Care Scalp Smoothing Moisture. I am lucky that I don't get dandruff like I use to. When I was a child, I got it all the time. The most common reason why I might get dandruff is dry skin. I think the Dove Derma + Care Scalp Smoothing Moisture shampoo was OK but I really like the conditioner. I could feel how hydrated my hair feels. I have starting to notice my daughter has been getting dandruff so I am hoping this shampoo will help her. When the weather is warmer I think a lot of people forget to apply deodorant or something. When the subway is crowded, no one wants to smell your bad body odor. I recommend the Dove Sheer Cool in dry spray format. It is like spraying baby powder under your arm pits. Make sure you shake and apply a lot so it will last you all day. It goes on dry, not wet, and it is not sticky at all. This is the perfect item to carry with you all summer long. Dove Shower Foam is one of favourite Dove's innovation. No bath sponge is needed and it is super gentle and does a great job washing my body. It is perfect for when your skin is tender from getting sunburned or getting over a flu. Dove came out with a Shower Foam for sensitive skin. It works just as great as the regular one and it has a great DOVE light scent. Dove Sheer Dry Spray Format. This giveaway will run from May 19th to June 16th, 2018 (midnight EST). Winners, You have 72 hours to reply. You must be 18+ Canadians Only. Good Luck! Psst - Can't win if you don't answer the mandatory question. I am not responsible for shipping and handling or damages of the prize. The prize is shipped by the Sponsor and they may substitute the prize depending what is in stock. Your information will be sent to the Sponsor for the purpose of shipping out the prize. Alberta. Shower Foam Shea Butter With Warm Vanilla Foaming Body Wash. I like the Purely Pampering Coconut Milk with Jasmine Petals Body Wash. I am from Nova Scotia ...I would love to try the Bar Go Fresh Rejuvenate Pear & Aloe Vera Scent sounds so refreshing for the skin Treen Goodwin Rafflecopter name !!!! Ontario and I would also love to try the Dove Invisible Dry Spray. I think the Bar Go Fresh Rejuvenate Pear and Aloe Vera would be great too! I normally do not use a bar soap. Hi,I'm here in Newfoundland and another Dove product I would love to try is the Invisible Dry Spray. I'm from Ontario and I love Dove products. I would love to try the Advanced Hair Series Quench Absolute Crème Serum. I'm from AB and I would like to try the Powder Roll-On Antiperspirant. I love Dove bar of soap. My favourite is the cucumber. I have been using Dove beauty bars for years as I have dry skin. When they go on sale I stock up. I am from Alberta and since I color my hair I would like to try both the Regenerative Nourishment Shampoo and the Conditioner. Ontario and I would like to try Daily Moisture Shampoo. I am from Alberta and would like to try the Go Fresh Revitalize Mandarin & Tiare Flower Body Wash or the Go Fresh Cool Moisture Cucumber & Green Tea Scent Body Wash. I am from Sk. and would like to try the Shower Foam Deep Moisture Foaming Body Wash. I love Doves dry shampoo! I am from Ottawa Canada and I love the Dove beauty bars! Ontario. I would like to try the Baby Dove baby wipes. I am from Ontario and I would love to try the Purely Pampering Shea Butter with Warm Vanilla Scent Beauty Bar. I live in Ontario. Would also love to try Dove bar soaps. I'm from Quebec and I would like to try the Shower Foam Shea Butter with Warm Vanilla Foaming Body Wash. I'm from ON and I love any Dove body wash! I would like to try the soothing-chamomile-dry-spray-antiperspirant. I live in New Brunswick and am tempted by the Go Fresh Rebalance Plum & Sakura Blossom Body Wash. I'm from Ontario and I'd like to try the Frizz Proof Serum. I live in NB and would like to try the Shower Foam Shea Butter with Warm Vanilla Foaming Body Wash. I am from Northern BC and I love the Dove bar soaps as we will all have sensitivities to smells, perfumes etc. I'm from NBb and I would love to try the Rich Moisture Tip to Toe Wash.